SpaceMaker™ Design frees your counter and includes cord storage. Built-in Can Opener glides through cans in seconds. Built-in Knife Sharpener easily sharpens knives. Built-in Bottle Opener Easily opens bottles without the hassle. Auto Shutoff Shuts of automatically for added peace of mind. 8.4 x 5.5 x 8.3 in. Put your mind at ease with the addition of an auto shut off feature. 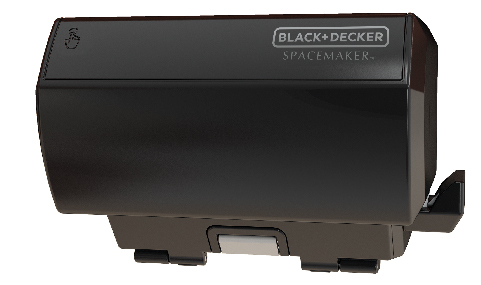 SpaceMaker™ Under-the-Cabinet Can Opener is rated 2.0 out of 5 by 27. Rated 5 out of 5 by Corky from Best can opener on the market I had one for probably 20 years and it finally died. Went without for two years using an expensive stand model. Not happy with that. I like my counter clear, not because I need the space. I found this can opener again 2 years ago and do not want to be without. Decided to purchase another one for back-up. Please do not discontinue. Marketing would get people interested in buying this model. Rated 1 out of 5 by Bubba from Rob M I purchased this online and realized that it only fits under cabinets with no lip (screw attachment holes are not lined up to mount it so that the release lever can clear the cabinet). Not well thought out by B & D.
Rated 2 out of 5 by dogpatch from under counter convenience; but, longevity not very Well folks I have had this for a little over a year now and it will not pierce the can no more...so i do not know what to do hope maybe can replace the cutter assembly...? but who knows @ this point. Rated 4 out of 5 by Limabl from Hands Free Use I bought this can opener at least 8 years ago and it works wonderfully. It will allow you to open a 7" can or taller as I have done it many times for my large family. The door opening may be a bit stiff when originally purchased but opens completely after several openings. I love this can opener for it's handsfree, space saving features. I noticed others say it will only open a 31/2" can. There is no way that a designer would design something to suit just a small group of people. That is not profitable. Rated 1 out of 5 by SallySam28 from not designed well! will be returned!!! I was so happy with my OLD Spacemaker can opener, so since we moved I purchased another which had to be ordered so I couldn't see THE flaw. I just received it today, and looking at the instructions I found that this one will only open a 31/2 inch can. Not all cans are that small!!! My old one, which was working when we moved, and was put up 15 years ago or more, would open ALL SIZES OF CANS!!! It basically would twist so that the side which stores under the cabinet, is the side that contains the blades,magnet,etc. It also had a button so you could remove "the dirtiest inch in you kitchen", so that it could be cleaned in your dishwasher. When it is "twisted", the side which was under the cabinet becomes the front side which opens the cans, with nothing but the counter top (far below) to restrict the can size. Since the front of this one flips down, and not far, only a small can, can be opened - NOT PRACTICAL AT ALL!!! Rated 1 out of 5 by CJRS from Poor design? This unit just arrived in the mail and I haven't installed it yet. This is due to the fact that the cover does not open far enough for a standard can to fit under the blade. Is it defective or am I missing something about the cover/hinges? Rated 1 out of 5 by TheRoving Wino from Not what I expected I've had a B&D SpaceMaker can opener for years and it finally broke. I thought I'd replace it with the same brand. It's very cheaply made and the front cover keeps falling open. I needed it to open larger cans and it barely opens standard size ones. I would not buy again and will not recommend it. Is the lower half of the can opener brown or black? Does this hang from a bracket? What are supposed to do with the spacers included with the can opener? I don't see them mentioned in the installation instructions.